3. 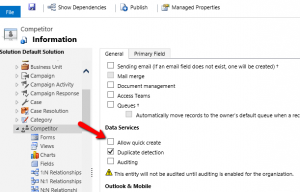 Deselect “Allow quick create” on the Data Services section of the entity. Save and Publish All Customizations. If it’s an entity the organization is not using, then you should remove access through Security roles instead – much easier than hunting down and modifying every place they are shown. If you want them to see but not create, then removing “Create” from the role will also remove the entity from the Quick create menu. There is only one place to change the definition – the entity itself. Roles would work, however, the challenge is that permissions for OOB entities with Quick Create typically span multiple roles, e.g. every role has some permissions for contact entity, for example. That means you’d have to modify a bunch of roles to achieve the same result. Okay…Fantastic Tip. How about getting rid of any/all of the 4 Activities shown in the small icons on left. My organization only wants people to be able to create Tasks and Appointments.